This chapter describes ways of getting involved in and contributing to the GATE project. Sections 12.1 and 12.2 are good places to start. Sections 12.3 and 12.4 describe protocol and provide information for committers; we cover creating new plugins and updating this user guide. See Section 12.2 for information on becoming a committer. The GATE bug tracker can be found on SourceForge, here. When reporting bugs, please give as much detail as possible. Include the GATE version number and build number, the platform on which you observed the bug, and the version of Java you were using (1.5.0_15, 1.6.0_03, etc.). Include steps to reproduce the problem, and a full stack trace of any exceptions, including ‘Caused by …’. You may wish to first check whether the bug is already fixed in the latest nightly build. You may also request new features. Patches may be submitted on SourceForge. The best format for patches is an SVN diff against the latest subversion. The diff can be saved as a file and attached; it should not be pasted into the bug report. Note that we generally do not accept patches against earlier versions of GATE. Also, GATE is intended to be compatible with Java 5, so if you regularly develop using a later version of Java it is very important to compile and test your patches on Java 5. Patches that use Java-6-only features and do not compile and run on Java 5 will not be accepted. If you intend to submit larger changes, you might prefer to become a committer! We welcome input to the development process of GATE. The code is hosted on SourceForge, providing anonymous Subversion access (see Section 2.2.3). We’re happy to give committer privileges to anyone with a track record of contributing good code to the project. We also make the current version available nightly on the ftp site. GATE provides a flexible structure where new resources can be plugged in very easily. There are three types of resources: Language Resource (LR), Processing Resource (PR) and Visual Resource (VR). In the following subsections we describe the necessary steps to write new PRs and VRs, and to add plugins to the nightly build. The guide on writing new LRs will be available soon. Each new resource added as a plugin should contain its own subfolder under the %GATEHOME%/plugins folder with an associated creole.xml file. A plugin can have one or more resources declared in its creole.xml file and/or using source-level annotations as described in section 4.7. Words comprising plugin names should be capitalized and separated by underscores Like_So. This means that they will format nicely in GATE Developer. For example, ‘Inter_Annotator_Agreement’. Plugin names should begin with the word that best describes their function. Practically, this means that words are often reversed from the usual order, for example, the Chemistry Tagger plugin should be called ‘Tagger_Chemistry’. This means that for example parsers will group together alphabetically and thus will be easy to find when someone is looking for parsers. Before naming your plugin, look at the existing plugins and see where it might group well. Below we show a template class definition, which can be used in order to write a new Processing Resource. 11 * to configure the resource appropriately. 20 * initiated using Factory.createResource() method. 38 * GATE Developer GUI’s application window. 53 * values are not supposed to be changed. 61 * annotated with a @CreoleParameter annotation. 75 * optional runtime parameter. 94 * required init-time parameter. The creole.xml file simply needs to tell GATE which JAR file to look in to find the PR. Alternatively the configuration can be given in the XML file directly instead of using source annotations. Section 4.7 gives the full details. Each resource (LR,PR) has some predefined actions associated with it. These actions appear in a context menu that appears in GATE Developer when the user right clicks on any of the resources. For example if the selected resource is a Processing Resource, there will be at least four actions available in its context menu: 1. Close 2. Hide 3. Rename and 4. Reinitialize. New actions in addition to the predefined actions can be added by implementing the gate.gui.ActionsPublisher interface in either the LR/PR itself or in any associated VR. Then the user has to implement the following method. Here the variable actions should contain a list of instances of type javax.swing.AbstractAction. A string passed in the constructor of an AbstractAction object appears in the context menu. Adding a null element adds a separator in the menu. Each resource (PR and LR) can have its own associated visual resource. When double clicked, the resource’s respective visual resource appears in GATE Developer. The GATE Developer GUI is divided into three visible parts (See Figure 12.1). One of them contains a tree that shows the loaded instances of resources. The one below this is used for various purposes - such as to display document features and that the execution is in progress. This part of the GUI is referred to as ‘small’. 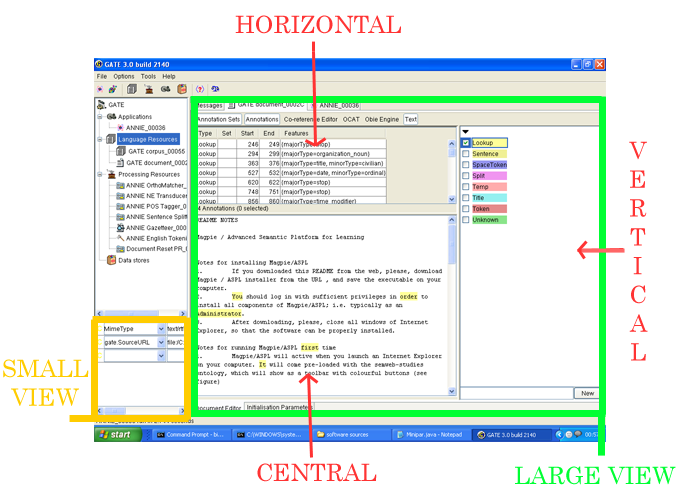 The third and the largest part of the GUI is referred to as ‘large’. One can specify which one of these two should be used for displaying a new visual resource in the creole.xml. Below we show a template class definition, which can be used in order to write a new Visual Resource. 9 * Note that here we extends the AbstractVisualResource class. 11 * underlying PR type it displays. 30 * belongs. This method is called after the init() method. Every document has its own document viewer associated with it. It comes with a single component that shows the text of the original document. GATE provides a way to attach new GUI plugins to the document viewer. For example AnnotationSet viewer, AnnotationList viewer and Co-Reference editor. These are the examples of DocumentViewer plugins shipped as part of the core GATE build. These plugins can be displayed either on the right or on top of the document viewer. They can also replace the text viewer in the center (See figure 12.1). A separate button is added at the top of the document viewer which can be pressed to display the GUI plugin. Below we show a template class definition, which can be used to develop a new DocumentViewer plugin. 9 * populating the GUI. If you add a new plugin and want it to be part of the build process, you should create a build.xml file with targets ‘build’, ‘test’, ‘distro.prepare’, ‘javadoc’ and ‘clean’. The build target should build the JAR file, test should run any unit tests, distro.prepare should clean up any intermediate files (e.g. the classes/ directory) and leave just what’s in Subversion, plus the compiled JAR file and javadocs. The clean target should clean up everything, including the compiled JAR and any generated sources, etc. You should also add your plugin to ‘plugins.to.build’ in the top-level build.xml to include it in the build. This is by design - not all the plugins have build files, and of the ones that do, not all are suitable for inclusion in the nightly build (viz. SUPPLE, Section 17.11). Note that if you are currently building gate by doing ‘ant jar’, be aware that this does not build the plugins. Running just ‘ant’ or ‘ant all’ will do so. The user guide is written in LATEX and translated to PDF using pdflatex and to HTML using tex4ht. The main file that ties it all together is tao_main.tex, which defines the various macros used in the rest of the guide and \inputs the other .tex files, one per chapter. A standard POSIX shell environment including GNU Make. On Windows this generally means Cygwin, on Mac OS X the XCode developer tools and on Unix the relevant packages from your distribution. A copy of the userguide sources (see above). A LATEX installation, including pdflatex if you want to build the PDF version, and tex4ht if you want to build the HTML. MiKTeX should work for Windows, texlive (available in MacPorts) for Mac OS X, or your choice of package for Unix. The BibTeX database big.bib. It must be located in the directory above where you have checked out the userguide, i.e. if the guide sources are in /home/bob/svn/userguide then big.bib needs to go in /home/bib/svn. Sheffield developers will find that it is already in the right place, under sale, others will need to download it from http://gate.ac.uk/sale/big.bib. Once these are all assembled it should be a case of running make to perform the actual build. To build the PDF do make tao.pdf, for the one page HTML do make index.html and for the several pages HTML do make split.html. The PDF build generally works without problems, but the HTML build is known to hang on some machines for no apparent reason. If this happens to you try again on a different machine. To make changes to the guide simply edit the relevant .tex files, make sure the guide still builds (at least the PDF version), and check in your changes to the source files only. Please do not check in your own built copy of the guide, the official user guide builds are produced by a Hudson continuous integration server in Sheffield. and would have the persistent URL http://gate.ac.uk/userguide/sec:misc-creole:fish. If your changes are to document a bug fix or a new (or removed) feature then you should also add an entry to the change log in recent-changes.tex. You should include a reference to the full documentation for your change, in the same way as the existing changelog entries do. You should find yourself adding to the changelog every time except where you are just tidying up or rewording existing documentation. Unlike in the other source files, if you add a section or subsection you should use the \rcSect or \rcSubsect. Recent changes appear both in the introduction and the appendix, so these commands enable nesting to be done appropriately. Section/subsection labels should comprise ‘sec’ followed by the chapter label and a descriptive section identifier, each colon-separated. New chapter labels should begin ‘chap:’. Try to avoid changing chapter/section/subsection labels where possible, as this may break links to the section. If you need to change a label, add it in the file ‘sections.map’. Entries in this file are formatted one per line, with the old section label followed by a tab followed by the new section label. The quote marks used should be ‘ and ’. Titles should be in title case (capitalise the first word, nouns, pronouns, verbs, adverbs and adjectives but not articles, conjunctions or prepositions). When referring to a numbered chapter, section, subsection, figure or table, capitalise it, e.g. ‘Section 3.1’. When merely using the words chapter, section, subsection, figure or table, e.g. ‘the next chapter’, do not capitalise them. Proper nouns should be capitalised (‘Java’, ‘Groovy’), as should strings where the capitalisation is significant, but not terms like ‘annotation set’ or ‘document’. The user guide is rebuilt automatically whenever changes are checked in, so your change should appear in the online version of the guide within 20 or 30 minutes.